Size helped in 2014 when it came to public IP licensing company stock performance, but it did not assure success. 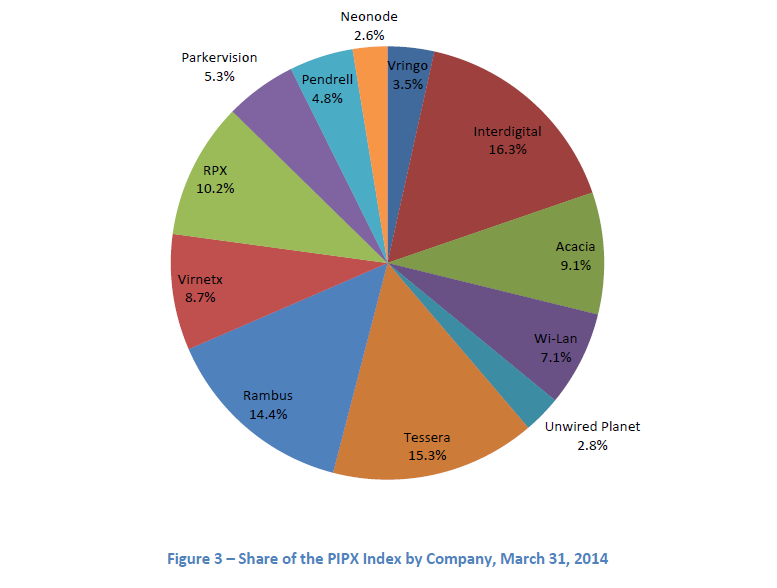 As a group, the twelve companies in the PIPX Public IP Performance Index out-paced the S&P 500 for the 4Q 2014 9.1% to 4.4%, with Neonode, Tessera and InterDigital leading the way, all with 4Q gains in excess of 30%. Marathon, under $100M in market cap for most of 2014 and not represented on the graph below, was up 17% for the quarter and 167% for the year. 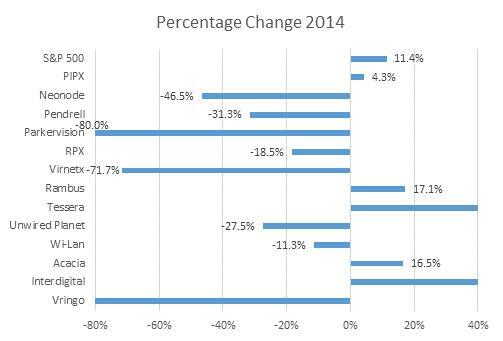 For the year 2014, however, companies in the index fare much worse, with PIPX companies generating a collective return of just 4.3% vs. 11.4% for the S&P 500. Tessera and InterDigital were notable performers each with 40% returns for the year. Rambus and Acacia were up about 17% each. Eight of the twelve companies in the PIPX, which is provided to IP CloseUp by Dr. Kevin Klein of Freescale Semiconductor, were down, led by ParkerVision, VirnetX and Vringo. 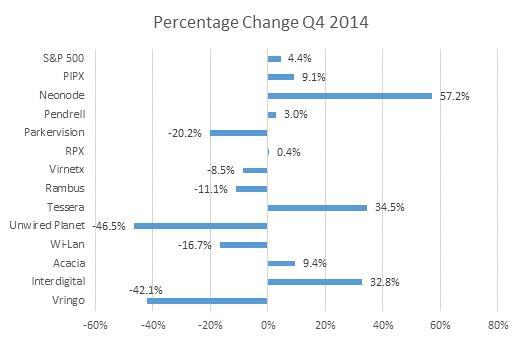 RPX was down 18.5% for the year and WiLAN 11.3%. The PIPX is weighted by value or market capitalization, so poor performance by smaller companies has less of an overall impact on index performance. It is difficult to draw too many conclusions from this, the first year of the PIPX. Investors tended to reward higher value stocks, but size was not a guarantee of performance, with RPX and others down against both the index and S&P 500. It’s important to recognize that despite uncharacteristic pressure on patent values due to legislative reform and judicial decisions, good assets have continued to hold value. With the recent Rockstar settlements and sale of 4,000 patents to RPX, we could be at or near the pricing bottom, depending on the nature of 2015 patent reform. A few small stocks bucked the trend, notably Marathon (MARA), which was not on the PIPX list because it was under $100M in market cap for most of the year. It is now at $110M and is being added. MARA ended the year up 167%. I’m pleased to say that Brody Berman Associates, my firm, helped to develop with the company’s early messaging. Unwired Planet: Can Cash Position Cushion Long Sales Cycle? With three recent Markman hearings and more than $100M in cash UPIP trading currently at $1.46 could be a good buy for those with patience and a strong stomach. At an earnings call last Thursday Unwired Planet, Inc. (NASDAQ: UPIP) CEO Philip Vachon reiterated his confidence in the future, and announced a renegotiated deal with Ericsson that will provide the company more flexibility going forward regarding patent transactions. Lake Street Capital senior equity analyst Mark Argento who has a “Buy” recommendation on UPIP, suggests that investors proceed with caution, but sees a $5.00 price target. Argento’s list of “Valuation” challenges and “Risks” in his report (linked above) provide useful guidance for anyone interested in public IP licensing sector. Unwired Planet is typical of the frustrations faced by many PIPCOs that own good patents but have to spend time and money, and encounter risk, to monetize them. Spending on legal fees and acquisition costs, without generating significant income, requires a strong constitution, even when there is cash on the balance sheet and burn rate that can be contained. Not every PIPCO is so lucky. Vringo Stock Dive: Bad Day in Court or Flawed Business Model? Google’s successful CAFC appeal has vacated Vringo’s already reduced $30M award. Could it have quit while it was ahead? 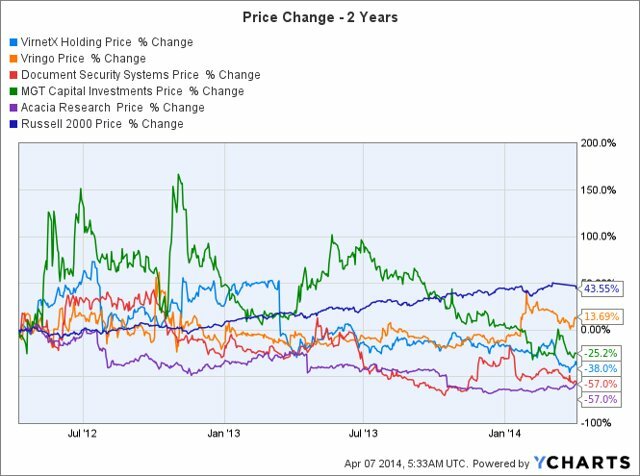 Vringo stock traded as high as $5.45 in 2013 and as low as $.67 a few days ago. It lost 80% of its value in a matter of hours when its big win was overturned by the Court of Appeals. Since then it has regained about 20% of its value. While the company’s dreams of a $1B+ payout appear to have been dashed, its future for some recent shareholders may not. IP CloseUp readers will recall that back in February, when VRNG’s shares were touching $5, I reminded them that a big win was not certain (here). Fresh off of a patent victory on Google’s AdWords in 2012 Vringo (NASDAQ: VRNG) was looking toward a record payout and a share price of $10 or higher. But something happened on the way to the party. On August 15 Vringo received news that it had lost an appeal filed by Google that sent the stock into a tailspin. Business Model or Model Business? The sudden, dramatic decline in VRNG shares begs a few questions: (1) Did Vringo over-emphasize the importance of the single victory? (2) Is its business model dependent on a big win and there is little else for investors to? (3) Does it simply not care about spikes in its share price? Loosing cases is a fact of NPE life. 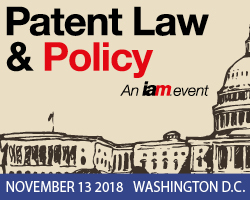 In the post American Invents Act (AIA) environment, NPEs must achieve a pipeline of quality patents, licenses and disputes to endure. 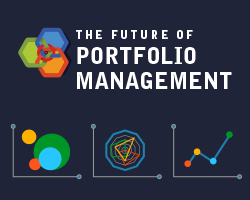 A “portfolio” of risk, if you will. While NPEs may lose more today than in the past — and win less big — the economics of patent enforcement are still viable for those with quality, capital and patience. Public ownership adds pressure to patent licensing companies, and may appeal more to short sellers than value investors. Shorts lose less than investors do. Vringo won $30M from a jury verdict in 2012, less than the $493M verdict it had sought. The judge overseeing the case ordered Google to pay a running royalty amounting to 1.36 percent of US AdWords sales. Those additional payments could have been more than $200 million annually. Instead, Google appealed. Was Vringo right to push the litigation envelope or should it (could it?) have taken the money and run? The Supreme Court has embarked upon a slippery slope, providing even less clarity about what computer coded inventions are indeed novel and non-obvious. Vringo plans to file a petition for an en banc review of the adverse federal appeals court ruling it received last week for its infringement suit against Google, AOL, IAC Search and Media, Gannett Company and Target. Those are not often heard. If the appeal is granted expect the stock to jump. If the appeal is heard, Google may think it prudent to settle, maybe not, given Alice v. CLS Bank. Vringo (NASDAQ:VRNG) Director Noel Joseph Spiegel acquired 30,000 shares of Vringo stock on the open market in a transaction dated Friday, August 15th. The shares were purchased at an average cost of $0.89 per share, for a total transaction of $26,700.00. 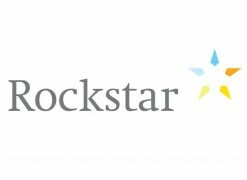 Following the completion of the transaction, the director now directly owns 50,000 shares of the company’s stock, valued at approximately $44,500. The purchase was disclosed in a legal filing with the Securities & Exchange Commission, which is available at this link. 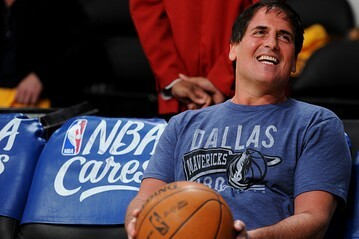 In 2012 Dallas Mavericks owner Mark Cuban bought a 7.4% stake in Vringo. Interest in public IP licensing companies or PIPCOs continues to build; so do supporters and skeptics. With some 30 trading on various exchanges throughout the world, “PIPCO Challenges” will be among the 16 sessions featured at the 2014 IP Business Congress in Amsterdam, June 22-24. 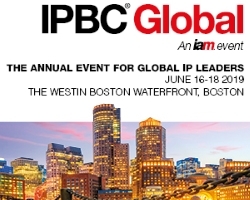 IP CloseUp editor, Bruce Berman, (yes, that’s me) will moderate the session, which promises to be a lively one. The number of publicly quoted IP companies (PIPCOs) has grown significantly over the last few years. They employ a number of different models and have enjoyed mixed success. Why go public in the first place? 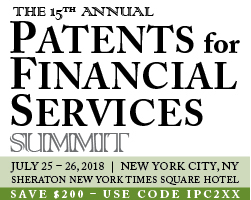 Other sessions at this year’s IPBC include: Cooperative Patent Purchasing, Building a World-Class Corporate IP Function, NPEs Under Attack, Deal Dynamics, Beyond Monetization, and The Next Battle Grounds. More than 600 are expected to attend from the U.S., Europe and Asia, with more than 80 speakers. The IP Hall of Fame also will induct four new members at a gala reception on June 23 held at the Krasnapolsky Hotel. The full program and speakers’ list can be found here. Are publicly-owned businesses that monetize patents a catalyst for innovation and job creation or a roadblock to profits? 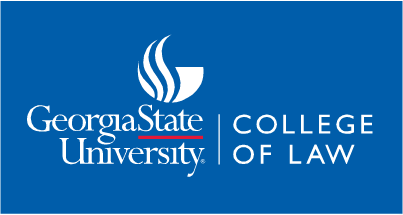 Georgia State University College of Law is featuring at its May 14 “Hot Topics” luncheon discussion of an emerging trend that has divided innovators, investors and lawmakers. 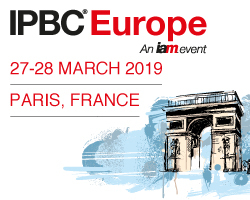 “How are Public IP Companies Affecting Innovation and Investment?” will be the focus of a mid-day presentation at which yours truly, Bruce Berman, has been invited to speak. Pubic IP Companies, also known as PIPCOs, are an emerging trend with no fewer than 30 currently traded on U.S. and UK stock exchanges. 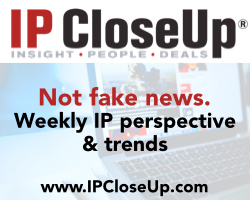 (See IP CloseUp® 30, here, for a list.) Some believe these businesses are no more than non-practicing entities, NPEs, or to some patent “trolls,” re-purposed for better access to capital. Others believe that PIPCOs, some of which are operating businesses that sell products, are part of the inevitable evolution of IP rights as an asset class, and are a viable business model. 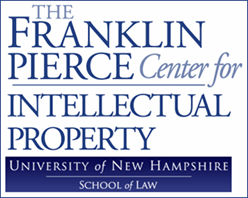 Will IP monetization companies whose shares are bought and sold on the public stock markets deter commerce, as some academics suggest, or will they serve as a catalyst for more and better innovation, and higher return on the R&D investment that underlies patents? Regulatory Disclosure – Burden or Opportunity? S.E.C. mandated disclosures will provide some transparency for public IP companies. They are an opportunity for all IP rights holders to put their intangible assets, amorphous at best, in a clearer business context. Hopefully, transparency will encourage other companies whose IP is an integral part of their particular value proposition to demonstrate more visibly the role it plays in generating return or protecting revenue and market share. 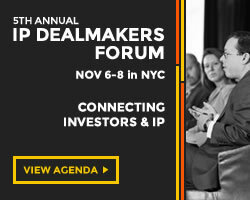 It has yet to be determined whether the investor public has the ability, or the access to the right information, to interpret complex legal developments, such as a favorable Markman hearing or a venue change in a patent litigation, and gauge their impact. PIPCOs like Qualcomm and InterDigital have led the way, while businesses like RPX and Acacia have come up fast behind them, and still others, “micro caps” with market value typically under a few hundred million dollars, are bringing up the rear. The smallest players are most dramatically affected by a successful settlement or licensing agreement. They present the best opportunity for investor return, but they also are the most volatile. 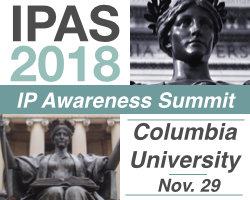 Past speakers at GSU Hot Topics and Corporate IP Roundtable Annual Series have included Kevin Rivette, author of Rembrandts in the Attic, Marshall Phelps, former VP of IP Business and Strategy at IBM and Microsoft, and Judge Paul Michel, who served as the Chief Judge of the Court of Appeals for the Federal Circuit. 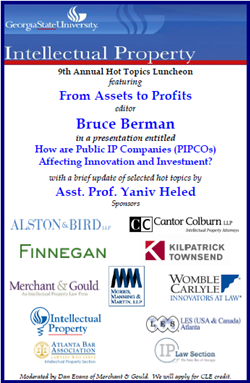 The 9th Annual IP “Hot Topics” luncheon will confront the public IP company question head on. For those interested IP Hot Topics is being held at the GSU Student Center on May 14, 2013 at 12 Noon. I look forward to seeing you there. Register here to attend. Or contact Christine Nwakamma at 404.413.9083, cnwakamma@gsu.edu. News aggregator serves up a convenient summary of developments in the public patent space. 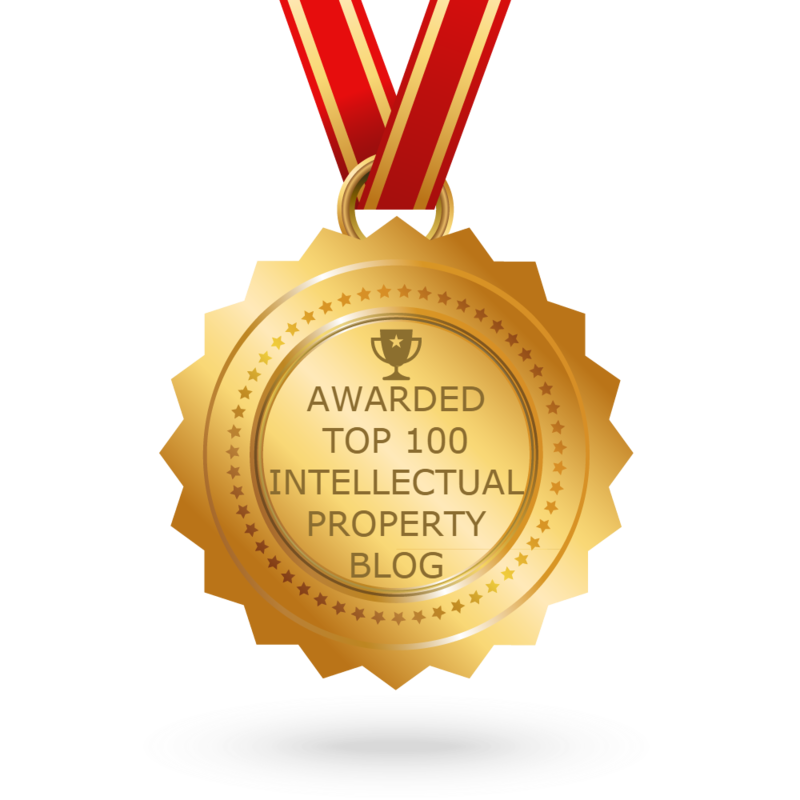 Patent Stock Review, a news and analysis website started earlier this year, provides easy to access background on a wide range of public companies involved in patent monetization, including Vringo, VirnetX and Acacia, as well as many that are less well-known. Published by Institutional Analyst, Inc.(AIA), an investment research firm founded in 1998 by Roland Rick Perry an editor, part-time analyst and investor communications consultant. Mr. Perry is responsible for launching the Internet Stock Review, and also provides coverage for companies in a number of distinct industries including, Biotech, Internet, Entertainment, Restaurants, Special Situations and Private Equity. Patent Stock Review is not rocket science, but it is very useful. Like many good ideas, it compels a reader to ask, “Now, why didn’t I think of that?” With its evolving core Watch List, it is a well-timed addition to the public IP company (or PIPCO) information space. Particularly useful are the latest blog posts and most popular blog posts, which provide insight into what people are saying. Mr. Perry started Institutional Analyst, the predecessor to IAI, in 1995. Earlier in his career he was a broker at Drexel Burnham Lambert. While most of the companies he updates are not his clients, Mr. Perry says that to align IAI’s with shareholders, he “seeks to have 90% of clients’ retainer represented by an equity stake.” The Patent Stock Review is a wholly owned subsidiary of a public relations firm Institutional Analyst Inc. (IAI), which provides or creates coverage for publicly traded companies. The website provides individual news feeds for each company on the Watch List, enabling investors to easily follow the entire group with a single visit. Through Thomson Financial, the Patent Stock Review’s hard copy research reports are made available to more than 22,000 institutional money management firms and over 950 research firms including brokers, investment banks and independent research firms. Look for expanded PIPCO 30 list in a future IP CloseUp. IP-centric businesses whose shares trade on the public markets come in many shapes and sizes — some are better suited for return than others. 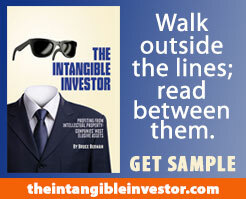 Many of the most interesting IP-rich businesses, from an investor perspective, are publicly traded, thinly capitalized companies with experienced management. 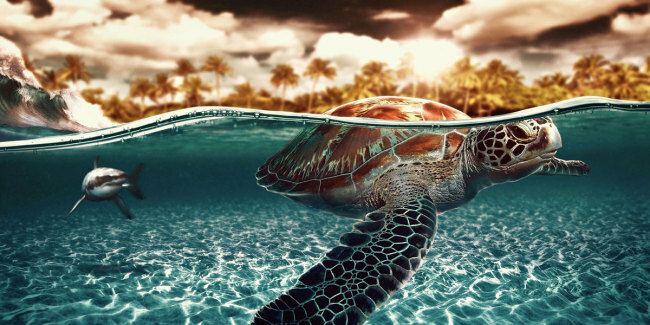 The best have a realistic view of their IP assets, usually patents, and the timing and cost of their disputes and value of potential licenses. The emergence of public IP-rich companies (PIPCOs) whose shares trade on the global exchanges is presenting new opportunities for patent holders and investors alike. They are the subject of the next (March) Intangible Investor, “PIPCOs – A Business Model Whose Time Has Come,” due out in IAM next week. Pure-play licensing businesses, non-practicing patent licensing companies with a single method of generating return, are being challenged by business models that provide more options and potentially greater return. Through self-generation, acquisition or merger with complimentary operating units, publicly held licensing companies are emerging as businesses that are more readily understood by investors, able to access the capital markets, and acceptable to the courts. At last count, there are no fewer than 25 companies that trade on US, UK and Canadian stock exchanges that include among their primary goals direct patent monetization. As recently at 18 months ago they would all be considered NPEs. Today, only a few are licensing-only pure-plays. The mix now includes enforcement businesses that support inventors and SMEs; licensing businesses that conduct proprietary R&D and obtain patents through filings; and those sometimes called profiteers that acquire rights from others, including operating companies that stand to profit. More public IP businesses today are a combination of models that include smaller, under-capitalized operating companies that are selling products or attempting to commercialize them. While the patent monetization business makes good sense, it is not for every holder or investor. With the exception of Qualcomm, Acacia, InterDigital and VirnetX, all with billion dollar plus valuations, public IP companies tend to be companies whose value is under about $500m. 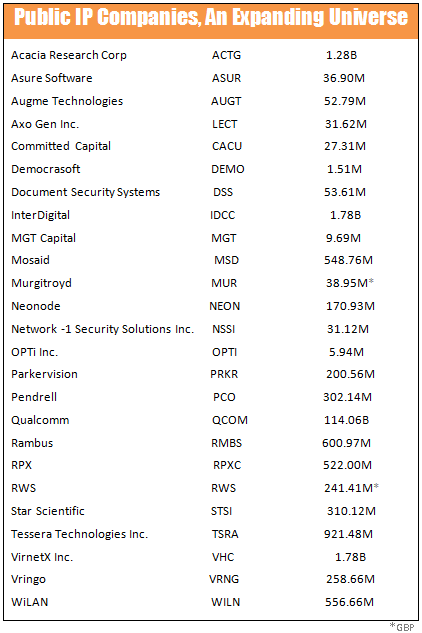 Mosaid, Tessera, Rambus and WiLAN comprise the next tier, between $500m and $1b. The remaining 17 companies are what Wall Street calls micro-caps. They include Vringo and Document Securities Systems, DSS, an anti-fraud and brand protection business with patents and trade secrets which has announced a merger with patent monetization firm, Lexington Technology Group. 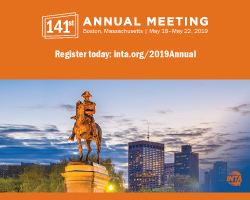 LTG (which BBA advises) is headed by IP veterans Jeff Ronaldi , who has run successful technology and monetization businesses, and Peter Hardigan, formerly director of investment management at IP Navigation Group and a Principal heading IP transactions at Charles River Associates. Warren Hurwitz, co-founder with Rob Kramer of Allied Security Trust, a successful IP private equity fund which has sold a $46 million portfolio to RPX, recently joined LTG as a director. The merger is set to close late 1Q. Defensive-minded patent-rich companies, like Microsoft, IBM and Samsung, arguably are also PIPCOs, although their lofty market cap and abundant revenue streams make their shares less dependent on the outcome of IP disputes. The lack of broad ownership of smaller PIPCOs means that they are frequently misunderstood and their shares are sensitive to news, good and bad. For stoic investors looking to take advantage of still inefficient market for generating a return on infringed patents, PIPCOs may be an option whose time has come. Market data as of 2/1/13.